This is the most catastrophic malfunction one can face when operating the pistol. It is a rare malfunction, but one must be prepared to deal with it before the need arises in a stressful environment. 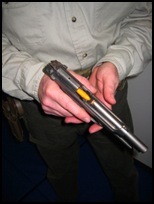 Lock the slide to the rear and insert a dummy round into the chamber. Insert a magazine loaded with at least one dummy round. Work the slide backward to unlock, and then ride it forward until the round from the magazine is well seated against the base of the round inside the chamber. You may just want to hit the slide release, but this will damage some plastic training rounds. There are two methods to clearing this malfunction. The first is a methodical, deliberate clearance. The second is faster but is difficult to master. The pressure, induced by the slide, against the round that is being fed from the magazine, will make the magazine very difficult to remove. Step 2: Remove the magazine. At this point you have two possible problems to deal with. The first is in the magazine. The leading round is likely to still be halfway seated and will present problems if you try to reload it "as is." 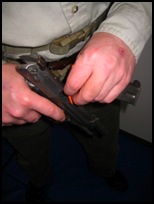 The second problem is in the chamber, where the loaded round may not have fallen free when the magazine was removed. It is entirely up to you, the order in which you address these problems. We suggest that you address each one as it is encountered. Magazine removed, strip leading round. 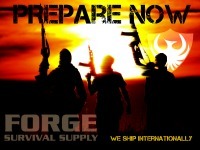 (Now you have a good magazine in your hand when it's time to reload.) Inspect Chamber, work the slide to eject the lodged round. Re-insert the magazine, work the slide and scan the environment. This method is hard on the wrist and arm until it is mastered. Many bruises will result. I have successfully performed this technique with Beretta 92f, Kahr K9, Glock 17. 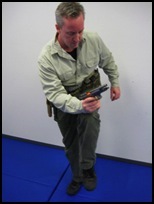 Upon noticing the double feed: While pressing the magazine release; strike your arm (just above the wrist) against your knee. Your wrist must be firm; a limp wrist will only create a bruise. The magazine will unseat and drop. The slide will ride forward and lock into battery on the round that was in the chamber. Work the slide to eject the questionable round. Insert a new magazine / rack the slide / scan for targets. You may recover the ejected magazine, but the leading round is now questionable and will need to be stripped off.